Tell someone who you love HOW much you love them! Here this sentiment is ideal for my family and close friends... and sending a unique shaped card that plays on this fun stamp.. all from the New Occasions Mini Catalog*!! Who do YOU Love to the moon and back? Get YOUR OWN Occasions Mini Catalog from me (and a hand-stamped gift) when you email me at Jamie@GettinCraftyStampin.com with your contact info and best time to talk... I will connect and send you a personalized gift with this new catalog! 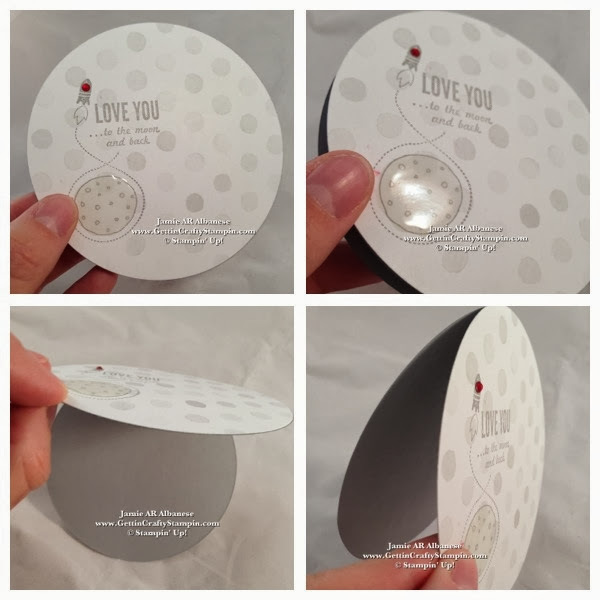 With a Smoky Slate card stock base folded using the Circles Collection Framelits to cut this card on the Magnetic Platform in the Big Shot Die-Cutting Machine. MAKE SURE, lol, to leave an area NOT Cut on the top so this card isn't in two pieces. 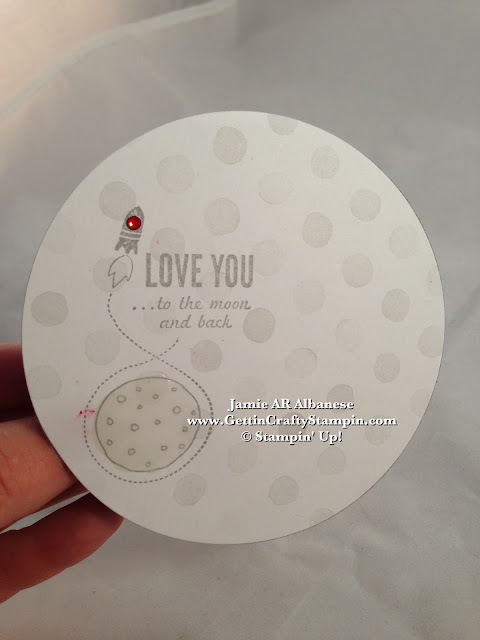 Cut out this 'moon' from the Watercolor Wonder Designer Series Paper*. Stamp this rocket with Smoky Slate ink on this 'moon'. I love this little play on the moon, don't you?? Accent the stamped 'moon' with the Crystal Effects liquid lacquer adhesive. This will take a little time to dry but will dry raised and shiny! Add a POP of color... taking our adhesive backed Rhinestone Jewels and a Red Permanent Marker to create this shining addition of red - perfect for this love filled card! Once Dry (the Crystal Effects) adhere to the front of the cut card for a cool shaped card that takes you right to the moon. Who would YOU Gift this to?? I'm over the moon that you came by today! I try to post daily and hope to see you back and often. Please remember to share me with your family and friends and join me in my in-person or on-line classes. 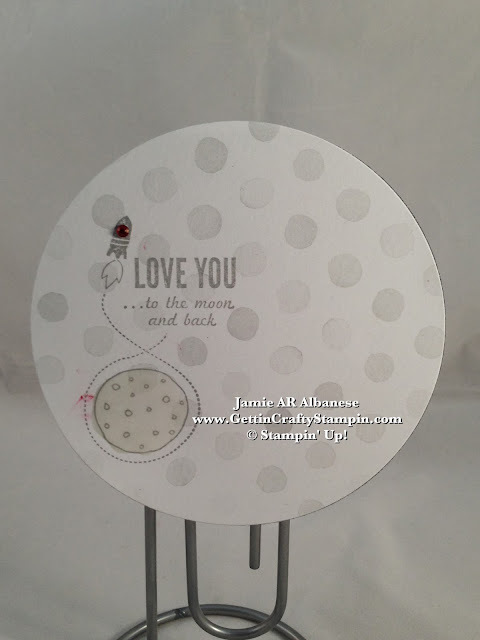 A simple measure creates an extra-special card that is sure to send someone right to the moon with your love! 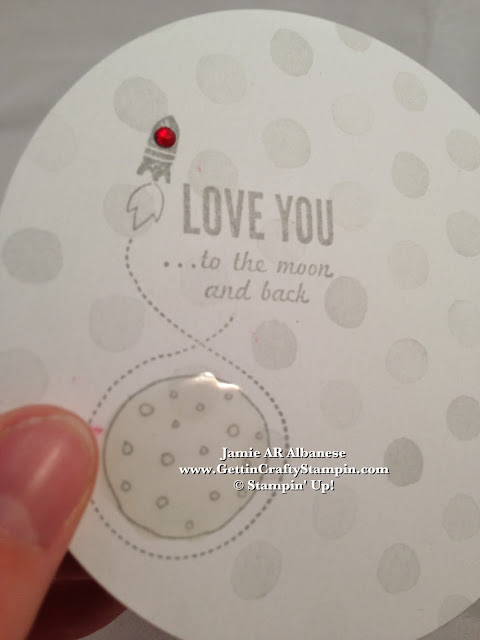 This new Watercolor Wonder Designer Series Paper and Love You to the Moon stamp set will make sending love fun and easy. Go ahead, let me know, Who do YOU Love to the Moon and Back?!? !